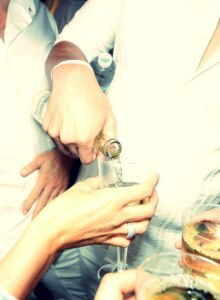 What has fast become a popular summer tradition in Seattle, the All White Party returns for Year 5! The party was started by Jeff Otis and Bryan Otis of Matthews Winery in Woodinville, where the event was held for the first three years. But due to space constraints, parking, curfew, and crazy growth, the Otis brothers combined efforts in year 4 with Brenton Webster and moved the party to the Seattle Waterfront - where 3000 people joined us dressed in all white and partied the night away! This year should be even better. Arrive in all white and then mingle, dance, drink, eat, take photos, hang out with friends, or make new ones. It's a party you won't want to miss! Must be 21. Let's party! Drink mixers: We'll have Coke, Diet Coke, Sprite, Soda, Tonic, and possibly Red Bull (still checking on this). No fruit juices will be available. Just trying to set realistic expectations. Bars will be CASH ONLY. Please plan accordingly and bring cash with you. ATMs will be availalbe on-site, but last year they ran out. Plan ahead and bring cash with you. We'll be displaying social media posts with #AWP2014 using Tagboard's technology, so post away! Because we don't want any of our guests drinking and driving, we strongly advocate using Uber when leaving the event, unless someone in your group is coming as the designated driver. We've worked out a deal with Uber to help take care of that. Enter promo code AWP14 for $20 off your first ride. After all, a party is only great if you arrive home safely from it. Parking is available via a six-story parking garage directly across the street from Pier 66. Two skybridges access the venue from the parking garage. There should be plenty of space for everyone again this year! This should be simple: Dress in all white. Not part-white. Not mostly white. All white. As an example, most ladies will be in all white dresses, most guys in all white pants and all white shirts. To make sure there are no issues at the door wear all white. This means shorts, shirts, pants, jackets, dresses, suits, skirts, scarves and any other articles of clothing must be ALL white. The only exception to this rule are your accessories. For example, belts, shoes, handbags, watches, and jewelry are excluded from the all white rule. However, we encourage your accessories to be all white as well. The dress code will be strictly enforced by our staff at the door. If you turn up wearing any other color than white (this includes but is not limited to khakis, blue jeans, stone wash jeans, black, gray, cream, tan or ANY other color that is not white) you will be denied entry, and there will be no refunds if you break this rule. It's really easy. All white means all white. We want everyone to get into the party, so please plan accordingly. Security staff will be checking for dress code at the door, and those not dressed appropriately will be turned away...so play it safe and come in all white. This year we're excited to highlight the Ben Towne Foundation to help support their mission to accelerate the pace of pediatric cancer research...until a cure is found. 100% of any amount you donate (donation tab is provided on the ticket page) will go directly to childhood cancer research, and one day, finding a cure! More than double the check-in stations - processing a line of 3000 people took us longer than expected last year. This year we've more than doubled the number of check-in stations and added a bunch of extra security and staff to speed things up this year. There will be a lot of people, so if you arrive at peak time, expect there will be a line to get in. We'll do everything we can to ensure the wait time is reasonable and the line moves as quickly as possible. No more red wine - we heard your feedback, and there will be no more red wine at this year's event. Additional bathrooms - We've more than doubled the number of bathrooms this year. Additional cash machines - the venue will have additional ATMs to ensure they don't run dry. However, we recommend that everyone just bring cash with them to the party. Alcohol options - We've added vodka, gin, white rum, and hard cider to this year's alcohol options. Q: Help! I can’t find my email confirmation or my tickets, what do I do? Q: Help! I never received my email confirmation, what do I do? A: As soon as you purchased tickets, we sent you an email confirmation. Sometimes it ends up in your junk mail folder. Be sure to check your junk mail folder, and if you use Gmail, be sure to check your other “tabs”. Gmail recently introduced a tab system and it automatically puts mail into different tabs for you, so your confirmation mail might be in a different tab. If so, move it to the “primary” tab so future confirmation email show up there. Add support@shindigg.com to your address book or safe list to ensure that future confirmation emails end up in your inbox. Q: Can I change the name on my tickets or re-assign them to someone else? Q: Do I need to bring a printed ticket to the venue? A: To help speed up your check-in process, yes, we recommend that you bring your printed ticket. All tickets are electronic, so long as the name on your government issued ID matches the name you put on your ticket then we can look you up in the system. Q: Help! I forgot to print out my ticket and I’m already on the way to the venue, will I be able to get in? A: Yes, as long as your name on your government issued ID matches the name on the ticket, you’ll be fine, we can look you up in the system. Q: Is this the same as previous years? A: This is the same All White Party you come to know and love, but like every year, we've made some improvements. If you like prior years, we think you’re going to love this year. Q: Do I have to dress in all white? A: Yes. If you’re not dressed appropriately, you will be denied entry and offered no refund. Plan accordingly.